Fat makes up an essential part of your diet, but choosing the right fats proves important to your health. Olive oils contain a healthy type of fat, called monounsaturated fat, which should replace sources of unhealthy saturated fat -- such as butter, and trans fat in partially hydrogenated oils when you prepare food -- in a heart-healthy diet. Extra virgin olive oil goes through very little processing to retain its natural ingredients, and its rich nutritional profile offers a variety of health benefits. Extra virgin olive oil comes straight from the olive and undergoes enough separating, washing and filtering for a natural product, the Olive Oil Source says. Virgin olive oil has a little more processing and still has high quality, but lower than extra virgin olive oil. Ordinary olive oils contain healthful properties, but not as much as extra virgin olive oil. The monounsaturated fat in extra virgin olive oil may reduce total cholesterol and low-density lipoprotein, or LDL -- the “bad” cholesterol -- in your blood, according to the Harvard School of Public Health. LDL can accumulate on the inner walls of the arteries, causing caridovascular disease that slowly starves your heart muscle of oxygen. As a result, the monounsaturated fats in olive oil promote life-long heart health. Polyphenols in olive oil may provide protective action against breast cancer, according to research reported in the Dec. 18, 2008, issue of “BMC Cancer,” because it regulates the activity of a gene, called HER2. Some types of breast cancer contain too much over-active HER2, and this triggers the uncontrolled cell growth that leads to tumor development. By inhibiting the activity of HER2, the polyphenols in olive oil might help slow or stop breast cancer growth. However, more research is needed to learn how well it works. Extra-virgin olive oil also provides beneficial vitamin E, a fat-soluble nutrient. Your body uses vitamin E to regulate cell-to-cell communication, and relies on vitamins E's antioxidant effects to protect your tissues from damage. Vitamin A also interacts with your blood cells to help control blood clotting. 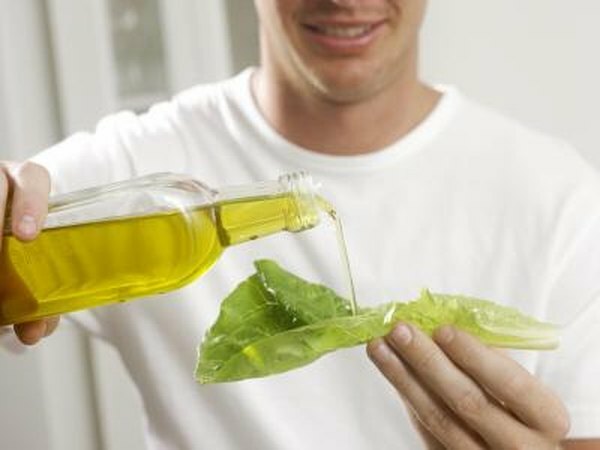 Each tablespoon of extra-virgin olive oil provides you with 2 milligrams of vitamin E, or 10 percent of your daily value.